Great condition - still original stickers on soles. POPULAR "CLARKS NARRATIVE" RANGE - BRILLIANT QUALITY. CHUNKY HEAVY LOOK SANDALS - WALKING - DURABLE AND HARD WEARING. ADJUSTABLE ANKLE BUCKLE FASTENING. Clarks Narrative 'Floberry Ivy' T Bar Sandals. Black Suede Leather with a small platform. Kindly donated so no history known. ~~Sold on behalf of KEMP Hospice ~~. Platform height : 1". Ladies casual comfort soft leather sandals, CLARKS, UK size 6D (standard width). Soft leather uppers in black with buckle fastening. Cushioned leather footbed and non-slip outer soles. These sandals look lovely on and are really comfortable to wear. clarks black sandals 5.5 leather. Very good used condition. Dispatched with Royal Mail 2nd Class. Comfort leather sandals in very good condition. UK 6D, EU 39.5M US 8.5M. I constantly have new inventory coming in. The Photographs shown on this page is the actual item for sale. Different monitors may show colours differently. VGC; These sandals have been worn but they are in very good clean condition. The heels and soles show only minor wear. Clarks Bendable leather sandals. VGC = Pre- worn the uppers, soles and heels will show only minor wear. Black Leather Sandals. Size UK6 D - EU 39. Condition is used and Excellent. Clarks Originals Chunky Black Leather Sandals Uk Size 6.5 Vgc. In amazing condition only worn 3 or 4 times. Clarks Artisan clog style sandals, size 8, D fitting. Black leather uppers. Slingback style. Heels approx 3.25” high. Lovely sandals in very good condition with very little wear to heels and soles. 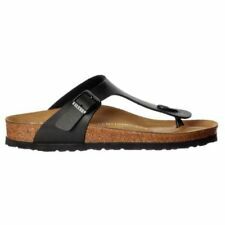 CLARKS Ladies black leather T-bar sandals with velcro fastening and mock zip on the T-bar strap. Slightly moulded footed which is spongy and a cushioned pressure pad for the heel. Lovely gladiator style sandals like new so have loads of wear left in them. CLARKS ACTIVE AIR BLACK LEATHER FLAT STRAPPY SANDALS. CLARKS ACTIVE AIR SANDALS. ANKLE STRAP WITH RIP TAPE FASTENING. SIZE UK 6 D. VERY COMFORTABLE WITH CUSHIONED INSOLE. In black leather with buckle strap closure, usual quality and in excellent look unworn condition. Fair – Signs or wear, may be fine bobbling on jumpers, no stains or missing buttons etc. Good – Obviously worn but still no stains, missing buttons. 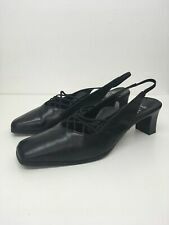 NEW CLARKS BLACK PATENT LEATHER SANDALS FLAT SHOES SIZE 4 D. Dispatched with Royal Mail 1 st Class. Worn once and in excellent condition. Clarks Justin Black Leather Sandals. Condition is Used. Dispatched with Royal Mail 2nd Class. Lovely pair of tustin sahara black leather sandals. From clarks Sandard D fit Theses have been worn and do show signs of wear but still in good condition. Velcro fastening and padded sole for ease and comfort, with lovely soft black leather. A few scuffs along the leather nothing that cannot be polished out, best to mention thou! Comes with box Please study photos as this form part of the description. Bought new direct from Clarks less than a month ago for £49. Stylish black leather sandals featuring Clark's signature Cushion Soft technology. They're very comfy underfoot and the leather is really soft too, so you don't need to break them in. BLACK Clarks Sandals 6D. Comfortable evening shoe or dressy occasion Dispatched with Royal Mail 2nd Class. 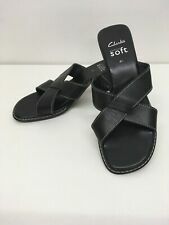 Clarks Trigenic Black Ladies Walking Sandals UK Size 6 Leather. Dispatched with Royal Mail 2nd Class. Funnily no one ever complains about that! small parcel upto 2kg £3.25. sandals in a size 6. BNWOT: item appears unworn, no sign of use, still has that 'new unwashed' feel. letter upto 250g £1.60 ( typically one thin/light top/t-shirt). Clarks clarene Black Wedge Sandal Size 6. In very good used condition. Material is black nubuck leather. Velcro fastening on ankle strap. Clark’s softwear black suede cut work sandals. Small inbuilt platform. Only worn once or twice. Clarks softwear black leather sandals with wedge style heel. These are in excellent condition apart from a mark on the right hand heel at the back and a tiny one on the left heel as shown in photos. 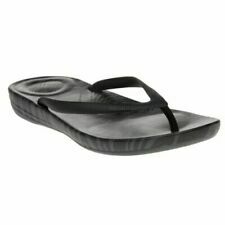 Clarks Ladies Single Strap Black Sandals with Above the Ankle Fastening with Gold Buckle and Elasticated Comfort Strip. No Heel and Rubber Sole. Still Have the Stickers on the Bottom. Size 8E. Dispatched with Royal Mail 2nd Class.